In 2009, the Tribeca Film Festival reached more than 348,000 people including talent, film-makers and various forms of hipster, through 530 screenings and other events. So it's no surprise that the 2010 rendition is again sporting a red carpet-worthy, blue chip sponsor line up, led by Founding Partner American Express. Categories now represented include financial services, consumer electronics, real estate, luxury retail, telecommunications, airlines, and consumer packaged goods, among others. Newcomers such as LG, Polaroid, and Caesars Atlantic City have signed on to tap into the spirit of TFF fans. Sponsors don't just pay for exposure, but often play an integral role by supporting the Festival’s infrastructure and experience. For instance, Heineken not only supports the festival through a clever OOH and online media campaign, sponsorship of the Audience Choice Award and, last but not least, free flowing beer at the 130+ after-parties! “The generous support of our partners helps to make the Festival a reality, and we’ve worked very hard to create partnerships for 2010 that will enhance everyone’s Festival experience,” said Jon Patricof, Chief Operating Officer of Tribeca Enterprises. New: Caesars Atlantic City, LG Electronics USA, Stolichnaya Vodka, and Time Warner Cable. Returning: Alfred P. Sloan Foundation, Apple, Brookfield, Borough of Manhattan Community College (BMCC), Delta Air Lines, Heineken USA, and RR Donnelley. Returning Signature Media Sponsors include Bloomberg, NBC 4 New York, NCM Media Networks, New York Nonstop, The New York Times, Vanity Fair and Youtube. Accenture, AT&T, B.R. Guest Restaurants, CHANEL, Crumpler, The City of New York Mayor's Office of Film, Theatre and Broadcasting, M·A·C, MOFILM, Polaroid, and smartwater. Media Friends of the Festival include 101.9 RXP, Getty Images, The Hollywood Reporter, Ogilvy & Mather, Radio Disney AM 1560, Screen International, Time Out New York. 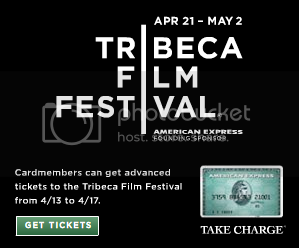 Finally, the Tribeca Film Festival includes over 20 Industry Sponsors and Supporters, which provide filmmakers with various services in-kind. For the first time in the festival's history, the Tribeca Film Festival will premiere a feature film, Keep Surfing, on a television - LG Electronics' new "Infinia" LED high-definition televisions (HDTVs). LG Infinia HDTVs are designed to deliver the ultimate in picture quality, bringing the director's screening room into your living room. As the only LED LCD HDTVs in the United States to receive THX Display Certification, LG's LE8500 and LX9500 Infinia series provide "something better" in home entertainment allowing viewers to experience the exact same colors, shadows and details as moviegoers in the theater. According to Geoffrey Gilmore, chief creative officer, Tribeca Enterprises, "More consumers are looking to bring the film festival experience home and with the evolution of LG's technology to provide theater-quality images, consumers have a greater opportunity for high quality screening experiences at home." LG Electronics USA also is the official HDTV sponsor of the Festival and has installed more than 50 LG HDTVs and a host of Blu-ray Disc players in movie theaters, box offices and special event locations throughout the festival. Once again, Heineken delivers best-in-class creative across several channels including billboards and online. A Heineken-sponsored TFF billboard close to the Holland Tunnel: "Don't listen to critics, be the critic." Aside from the Audience Awards and after-parties, Heineken also gets external media such as Festival Tips. Everyone loves the red carpet photos right? Coming on the heels of its 2009 reorganization, Polaroid has launched a number of rebranding efforts including sponsoring the official Tribeca Film Festival Photo Gallery. In addition, Polaroid will be onsite at a variety of events to take candids. No word on whether this was the genius of its latest hire. Delta, which has sponsored pretty much everything New York-sports in the past couple of years, continues in its role as Official Airline of the Festival. Not only does this gather them exposure and assist in their efforts to build "hometown" brand positioning, but it's been a content acquisition play for their in-flight entertainment system. For the past three years, Delta hosted a program called “Delta’s Fly-In Movies” where the traveling public could view and vote on their favorite films while in the air. This year, Delta is activating with the World Narrative Competition. 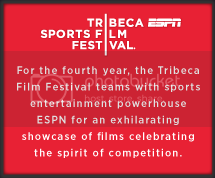 2010 marks the fourth year of the ESPN and the Tribeca Film Festival collaboration, which finds common ground between sports fans and movie buffs in delivering sports films, documentaries and live events throughout the 12 days. Through the partnership, sponsors can extend their participation across ESPN's multimedia channels including: ESPN2, ESPN Classic, ESPN.com, ESPN the Magazine and ESPN Radio. Check out ESPN's 'Pardon the Integration' sales kit for more info. Go to TFF's site and you'll find a password-protected extranet and highlights section for TFF sponsors. 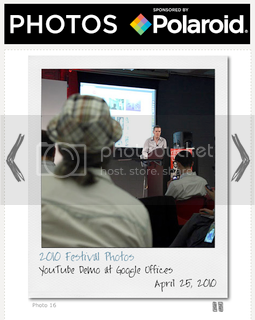 A nice touch and easy way to seamlessly share info and assets with relevant parties.